Central Theme: Jesus’ work on earth was finished at his death. Introduction–Come up reading the last page of a book. “I just have a few more words to finish.” It is good to have a book, a task or a work finished. Jesus’ work on earth was finished when he died on the cross. I. Have a member Read John 19:30. A. Tell the story of Jesus‘ death on the cross from John 19. B. The week leading up to the death had been filled with important events. II. A crucifixion sermon is wonderful and awful. A. Wonderful because no event in history is as important as Jesus’ death and resurrection. 1. Yet, even explaining the death seems to make it trival or lessen its importance. a. How can the horror be told? b. 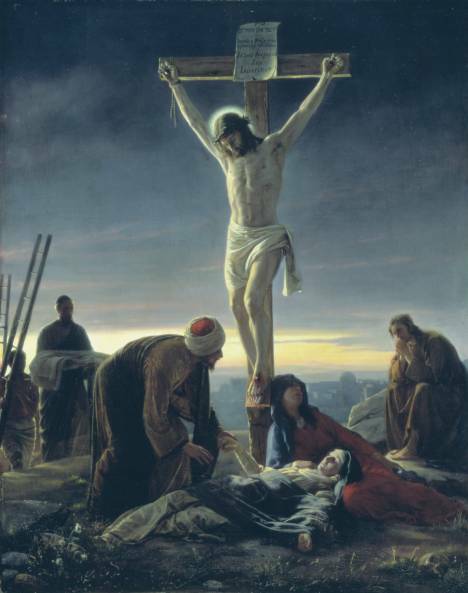 Being crucified was the worst, most violent form of death. 1. In fact, it does not begin with horror but with love. A. Jesus loved you enough to willingly give his life. C. Jesus set the limits of his death. D. He suffered but only as much as was necessary to pay for our sins. III. Jesus‘ death was terrible but necessary. A. If you have not, ask Jesus to become your best friend and your boss. B. He will forgive you and he already loves you. Conclusion–Jesus’ work was finished when he died.